Some highlights – and some visual memories – from last Saturday’s event on the Wood Street Plaza, which was part of the first national Small Business Saturday. 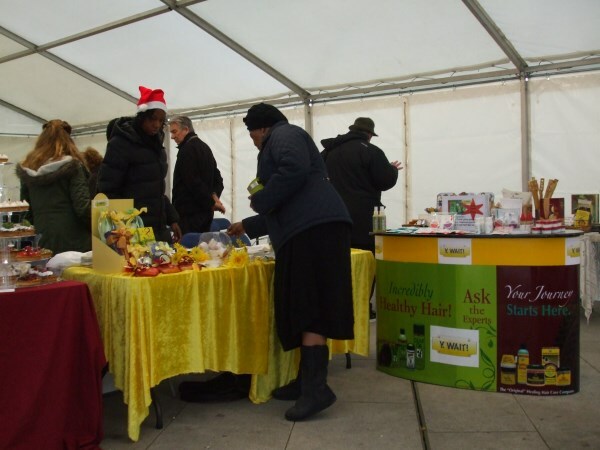 Hundreds of people of all ages and cultures – perhaps over a thousand in total – came along to enjoy the stalls, entertainment and free food and drink. Many called in from Wood Street and around, but some had come from as far afield as Broxbourne and Loughton. 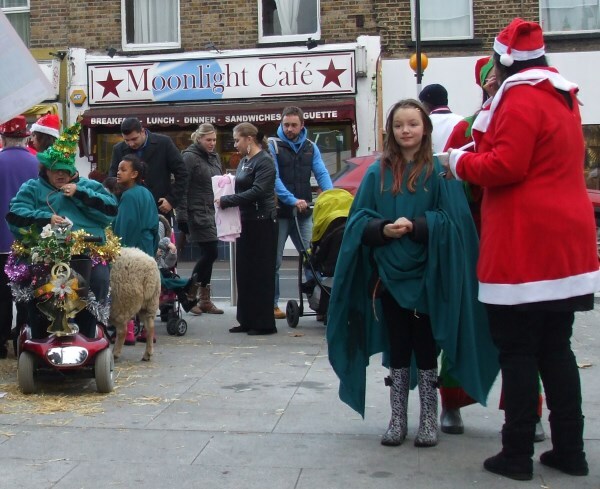 Apparently our event was the most popular of the eight running across the borough. Santa was so busy he had to call for some extra presents! 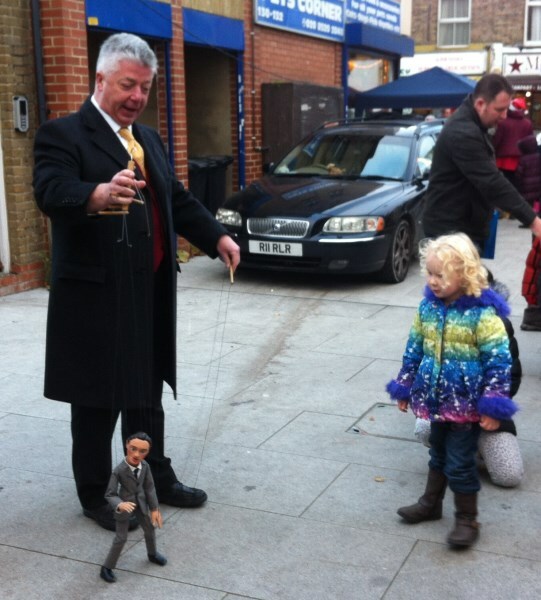 … and our puppeteer Geoff Felix also provided some impromptu street entertainment between his two sets. 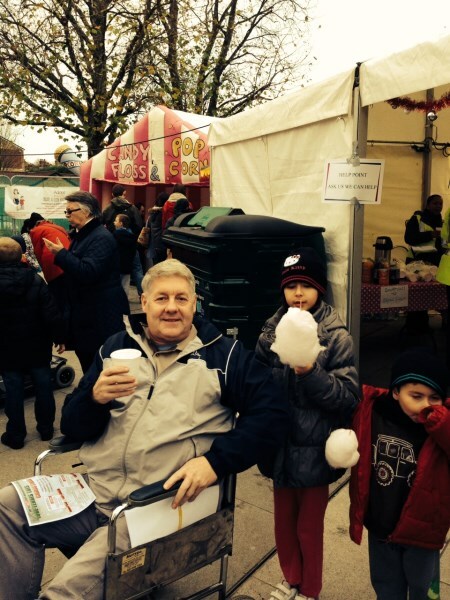 Our own chair Graham Hodgkiss paid a visit in his first outing since his injury three months ago – and provided most of these photos. Resident DJ Tony Tunes (from the Wood Street indoor market of course), plus the traditional folk tunes of the Clean Peas, provided a charming soundtrack for the food, arts and craft stalls stalls (including local charity Significant Seams). 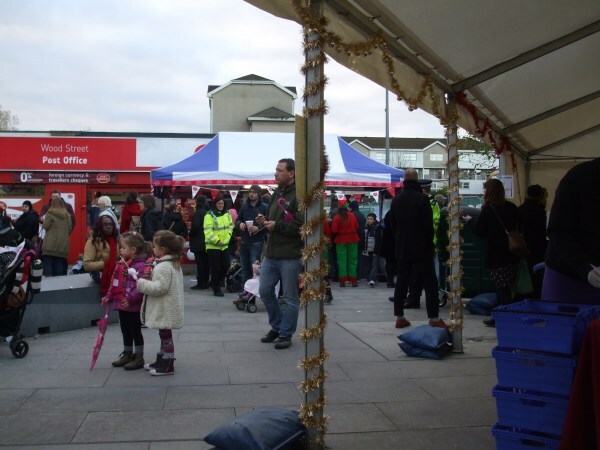 The Wood Street Post Office generously shared out tasty home-made rice dishes and vegetable samosas. 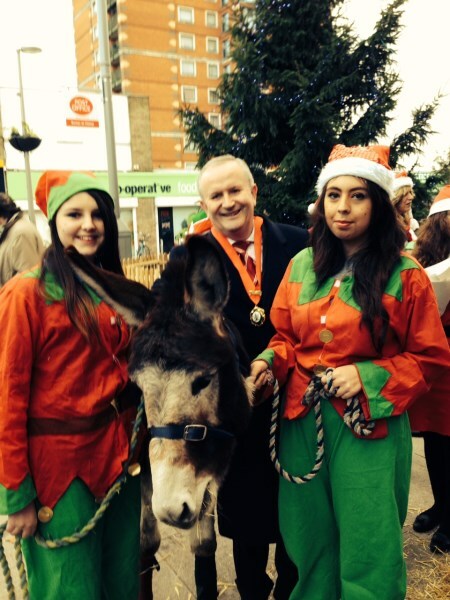 … and a donkey with team of elvish helpers, some of them pictured below with Ward Councillor and former Mayor Richard Sweden. That’s Richard in the tie, in case you are wondering! 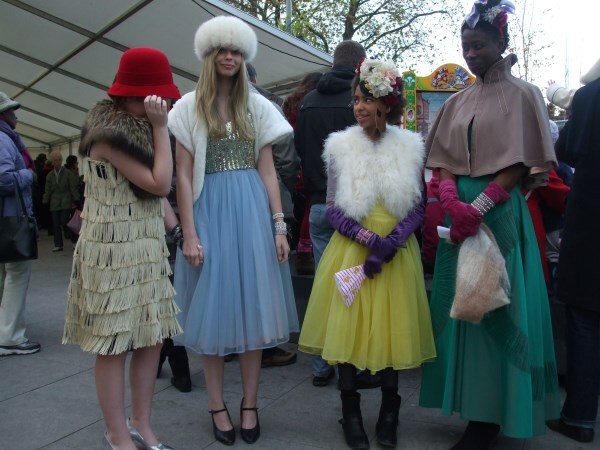 Meanwhile the models from Gigi’s vintage clothing stall added a touch of class. 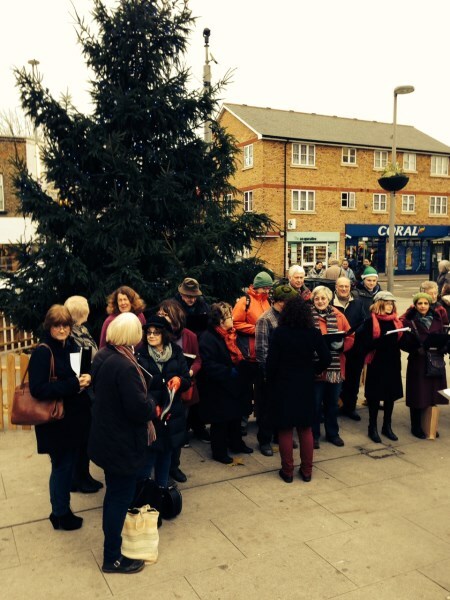 The closing carol singing circle was a joy to behold (and thanks to Waltham Forest Council for giving us wooden fencing around the tree – so much more attractive than those metal crowd control fences we had last year). Plus, it stayed dry! (and a few degrees warmer than the forecast promised earlier in the week). 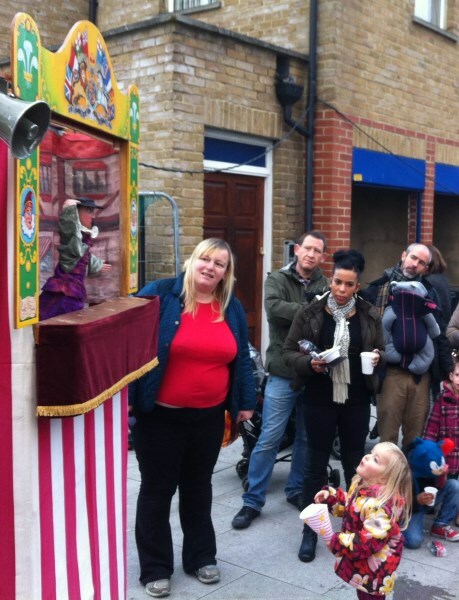 A big thanks to everyone who made the day possible, including Waltham Forest Council for providing the funding. A special thanks to the Council’s cleansing team for their efforts before, during and after the event – it made a big difference. There was some interesting chat about future ideas for markets and events in the Plaza. What do you think we should be doing to make the most of Wood Street’s increasingly lively public space? And what did you think about the event itself? All thoughts and feedback welcome. 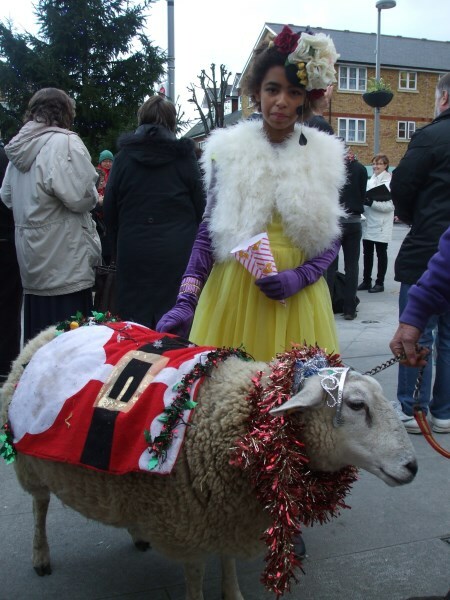 Next Start thinking of funding ideas – and have a fine festive season!